Yet another delicious, tasty and healthy sweet dish for you! Beetroot halwa is made from red beetroot and sugar, whereas I am using organic jaggary instead of sugar. Beetroot halwa is not much popular. Who ever is not familiar with this sweet dish, can try once. This is very healthy and tasty. At first instance, beetroots look rough and dusty, you may be surprised by how sweet it tastes. In fact, beetroots contain highest natural sugar content of all vegetables, that is why this sweet dish requires very less quantity of jaggary (or sugar). Beetroots have got a number of essential nutrients which help in improving heart health, lowers the risk of diabetes complications keeps you healthy. If we eat beets raw,it is crunchy, but turns soft when it is cooked. You can enjoy beets raw in the form of salad or sliced and as well as you can enjoy beets cooked or steamed. In all forms it taste grate and provides vitamins and minerals required to the body, making them a healthy addition to your diet may result in amazing improvement in health. Whenever you try new things in cooking, it is better to prepare it in smaller quantity. Once you feel you are good at preparing the dish, you can prepare in larger quantity. You can try this, I am sure you will succeed. Let’s see the preparation of tasty, healthy and delecious Beetroot halwa. Cardamom Powder – 1 Tea spoon (4-6 in number). Place small frying pan on medium heat and pour 25 grams cardamom (without peeling) in to it. Roast them until they start expanding in size and splitting. Allow them to cool for 10 minutes. Make a fine powder (with skin). You can store it in a bottle and use it instantly whenever you prepare sweet dish. It gives a pleasant aroma to the dish. You need not use any artificial essence available in the market while preparing sweet dish. Wash Beetroots with salt water so that beets will get rid of all mud and dust on it. Grate them and keep it aside. Finely chop the jaggery and keep it in a bowl. Crush all dry fruits except pumpin seeds and raisins, keep them in a bowl. Place a frying pan on medium flame and pour half a table spoon of ghee in it. 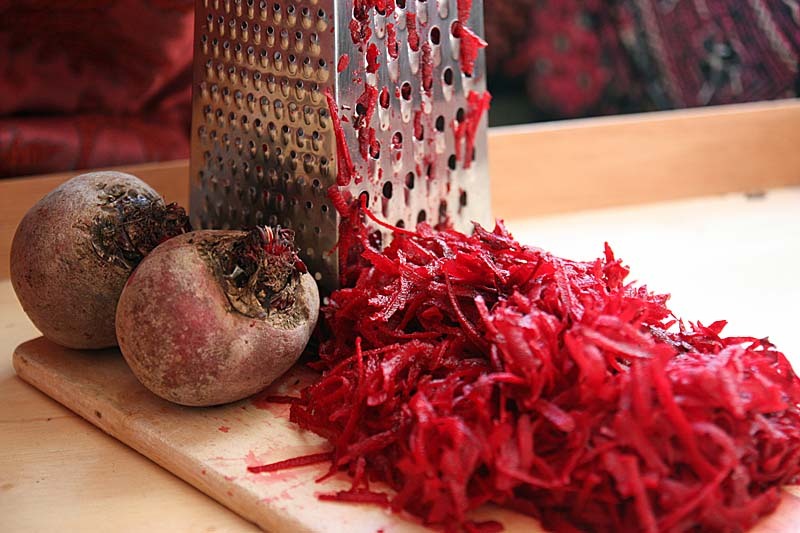 Wait until ghee gets heated, it may take 1 or 2 minutes and then pour grated Beetroot in to it and mix it well. Cover the pan with lid and allow it to cook for 5 minutes, which helps in softening the beets. Open the lid and stir it gently. Cook it further for 10 minutes without covering the pan, stir it once in a while so that it will be cooked uniformly. Add chopped jaggery, mix it gently with ladle and cook it on medium flame for 10 minutes, stirring occasionally. After adding jaggery, the dish will leave water, you will have to cook it until it absorbs all water and become thick. This process makes the dish tastier. it further for 1-2 minutes and take off from the heat. With the help of a spoon, takeout a small quantity of halwa and touch with fingers. You should feel the sticky ness of the halwa. If you feel it is not done completely, you can cook it for further 5 minutes. Take out the halwa to a serving bowl and serve it hot or cold. Your delicious, tasty and healthy beetroot halwa is ready to serve. You can serve it hot or cold, it tastes good in both the ways.